Part of you wants to ignore it and hope it will go away. Zimbabwe is such a messed up place that it hurts to even think about it. In the midst of it all, one group is making sure that actions and events are being documented: Sokwanele. It’s amazing how simple visuals can take a bunch of data and make it real. Above is a chart showing the mayhem, broken down by type. It’s a sick story, but one that can be told in almost real-time because of our current technology. 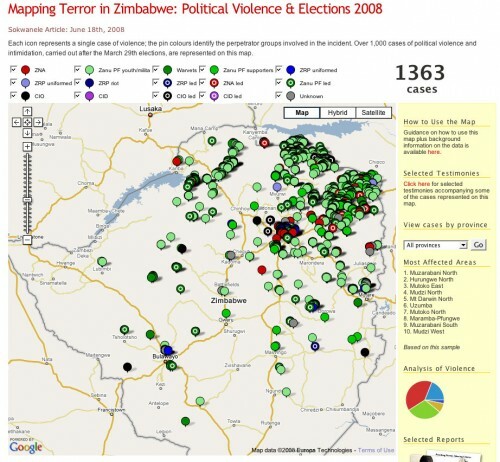 This is why mapping and other visualizations are so important. Sokwanele is simply collecting the news reports then archiving and parsing them for information. When those stories come in ones and twos throughout the week, it’s easier to ignore. When they’re put forward as a body of evidence using visuals to show their aggregate statistics, it becomes damning and impossible to ignore. 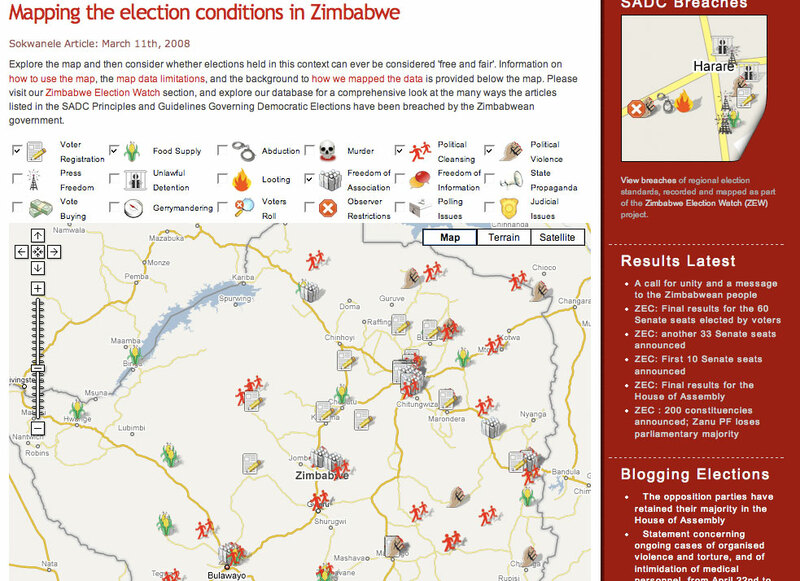 By the way, both of those maps only show a small sample of what is being done. Not everything is reported to news organizations or directly to Sokwanele. Some people might ask, “But, does Sokwanele’s map help at all?” I’m guessing that it doesn’t directly. However, what it does do is proved fodder for organizations inside and out to make an even stronger case against this repressive regime. Those of us on the Ushahidi team think on this stuff a lot. We’re not off trying to win mashup competitions and raise funding for further development because we think it’s a fun startup idea. No, we’re doing this because it matters and we believe our tool will help raise awareness and empower organizations to understand and activate against wrongs. If anything, I’m compelled more than ever to figure out how technology can continue to create change in truly screwed up places. 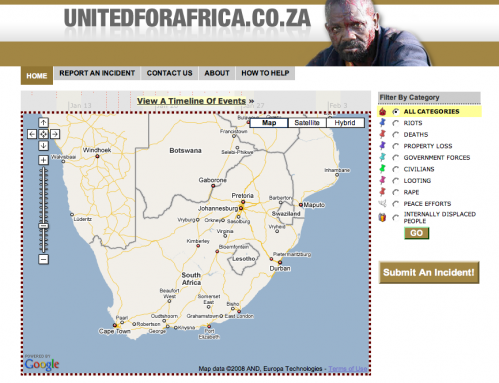 The Ushahidi engine (version 1) is being used to map reports of the current xenophobic attacks happening in South Africa on a site called UnitedforAfrica.co.za. The attacks are a product of foreigners moving across the borders, especially Zimbabwean, and encroaching on the lives of South Africans. I suggest reading this BBC article for more information. Quirk, a web marketing agency in Cape Town is leading this charge, with Tim Shier, Rafiq and David Kobia all pulling VERY late nights last night to make this come together. Quirk will act as administrators on this build, and the Ushahidi team will step away from it as soon as the build is done. The most important part of this type of campaign is to get the word out. SMS, email, call your friends and family all over South Africa and get them to tell their friends so that more reports come in. The more that come in, the better the tool. So, what’s up with this “Ushahidi engine”? As you might/might not be aware, we’ve worked up a plan for a new version of Ushahidi (v2) that would replace what we’ve done as a free and open source tool for crowdsourcing crisis information and then visualizing that on a map. We’ll be presenting that idea next week at the NetSquared challenge in California, and are already building the basic architecture for that. This collaboration with the guys in South Africa ends up being a perfect example of the need for a rapid deployment tool like Ushahidi. What we could use is more developers from around the world to help us. We already have a good dozen who have committed to helping in some way or other, ranging from the Bay area in California to Kenya to South Africa and Malawi. If you’d like to take part, please get in touch!